We decided now is the time to head south to the sun, so a long trip across the top of Italy, driving through Slovenia and on to Croatia was the plan for the day. The drives we have done before across northern Italy’s motorways drag a little but there is always some new challenge or something to learn. Driving through Slovenia we expected would bring challenges too. A few miles from the border with Slovenia, we stopped at a service station to fill us with coffee & croissant and the van with Diesel. I spotted a booth selling Vignettes for Slovenia. I joined the queue and asked if we needed a vignette for just for one day to drive through Slovenia and directly on to Croatia? Yes, you need a vignette if you are to drive on motorways, we weren’t sure if we needed to drive on motorways at all but with a long queue forming behind us, we spent the 30€ and bought the vignette. Back at the van checking the map we didn’t need to go anywhere near any motorways for our brief trip driving through Slovenia. Angry with myself for taking the wrong decision under pressure I went back to the window (now no queue at all – typical) and the very nice, friendly lady refunded us – phew – that’s dinner this evening! 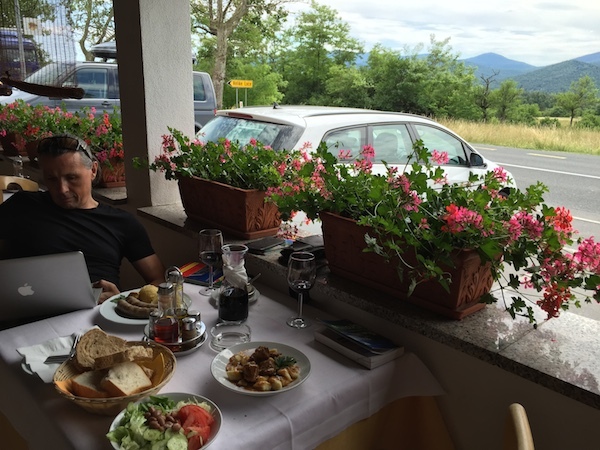 Our heads and stomachs called lunchtime as we drove through the Slovenian villages and stunning hilly landscape. Slovenia is a visually beautiful country and one which, I’d like to explore further. Finally a roadside ‘restaurant grill’ promised home made pasta and wifi – perfect! Wonderful valley views from the quiet restaurant. I had home-made gnocchi with goulash and Adam chose well with home-made boiled sausages; so good that I asked if I could buy some from the kitchen to take away with us and cook at some point later in the van.